Well, last week I rehashed some of the highlights of 2014 for me. This week, I’ll talk about what I’m looking forward to in 2015. Thus far, I’ve got two appearances lined up, but I’m optimistic more will happen. I’m always on the lookout! In early April, I’ll be a comic guest at MegaCon and will be in Independent Press Row with my friend and hot new comic writer Wes Locher. If you’re in the Orlando area and you like all things geek, you can’t not be at MegaCon! My other planned appearance is the Florida Writers Conference in Orlando in October. The details aren’t finalized yet, but I’ll be giving a presentation or two and probably be on a panel or two. Last year was my first and it was fantastic! I’m very excited to be returning. I’m hoping the new year will bring me some news of the two projects I have floated about: Cat & Mouse and Beah. If I haven’t finished them by the time of this writing, I hope to get two other pitches circulating which I’ve told you about: Citizens and The Rejects. Just click on the titles to go “like” the Facebook pages for each of them where you can find art and updates on the projects. I’m excited that Trumps has new life in it because Anthony Pereira emerged and is alive and well—and drawing the 2nd issue. Plus, I’m hoping to announce an inker on the project soon! I’ve hinted at it before, but I’m working with a publisher to try to come to a happy agreement to see The Gifted come to fruition. While I’ve written it as a novel, he’s very interested in pursuing it as a graphic novel. The challenge is to find a way to get the art done for the small press. I’m very optimistic about it because the publisher seems to want it to happen. I’ve also talked to artist Kevin Tuma about doing a Champion one-shot. Tuma wants to publish the work himself, so I’m excited about seeing that happen. I briefly mentioned this a few months ago, but I “internet-met” a talented artist who is a martial arts student of a good friend of mine. I don’t know her that well (I did say “internet met”) and I don’t think she’s a huge comic fan, but her pencil work is astounding! So I hope to finish putting together a pitch for a sci-fi piece with newcomer Gabriella Rossetti. Around Y2K I did a short comic adaptation of a short film by some folks in the Muscle Shoals area. Thanks to the changes in digital technology, I’m going to see that it becomes available. 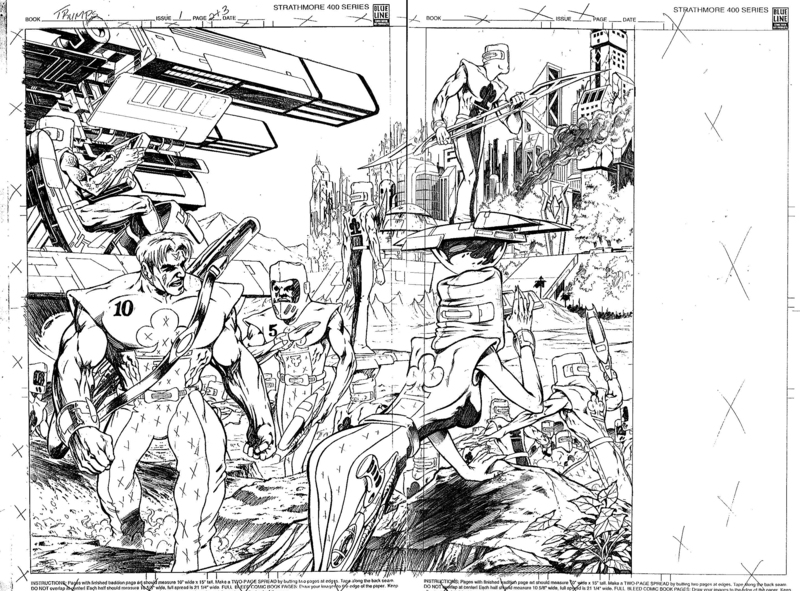 It’s being colored by my old Malibu colleague Albert Deschesne. Speaking of older work, I’m in the process of collecting some of my older work and making them available as both a compilation and in digital format. Works to be collected will include Demon’s Tails, Krey, and some others. Something else I want to do is an anthology that collects some of my shorter comic work. I’ve only got a couple at this point, but I’m hoping to get some others done. I’ve talked to a few other artists who expressed interest in putting something together: Patrick Rolo did some work with me back in the Malibu days and Moye Daniel almost did some work with me…but disappeared. Both of them have reappeared, so I’m hoping we can make something happen. Lastly, I really hope to finish my Cat & Mouse novel and send it to an agent who has already agreed to read it. I’m more than 30,000 words into it, I just need to get BIC! So…as you can see, quite a bit of stuff that I’m excited about that will hopefully make 2015 an exciting year! So last week I started off thinking I was participating in a blog tour that I’d accidentally already done, then shifted to the release of The Remaining, then started yakking about the projects currently in the works. Well, I got kinda excited talking about it but really ran out of space…so I wanted to finish talking about the other projects I’m working on that just aren’t quite as far along. So first up I’ll give you the Cliff Notes version on this first project. In the late 90s, I started working with artist Anthony Pereira, an artist I’d actually discovered while working at Malibu. We decided to do a project. He finished the first issue…and then promptly disappeared. Seriously. Well, fifteen years later, he’s now found—AND working on issue #2 as if no time had passed. It’s really kinda cool. But, the fact that the first issue of Trumps is completely penciled is the reason this one is listed first here. I’m in the early stages of a Champion mini-series with artist Kevin Tuma. Kevin’s been around for a while and we’ve actually worked on a single issue before—but it was never published. Kevin drew issue #3 of the ill-fated Vortex mini-series published by Comico. While I haven’t asked, he’s probably still owed a chunk of money like the rest of us. Champion, for those of you who are paying attention, was a secondary character in Cat & Mouse vol. 1. He played a more pivotal role in SilverStorm vol 2. So there are some changes in store for the character, but I think you’ll like what’s going on with him. Through my old Malibu pal Kurtis Fujita, I “met” artist Gabriella Rosetti. On facebook (of all places, right?) Kurtis pointed out that one of his martial arts student was also a really talented artist. And because Kurtis is certainly one whose artistic “filter” I trust, I want to check out her work. I was blown away by her pencil work! We started chatting and she’s now working on the preliminary sketches while I flesh out a plot. I don’t have her permission to post this image—and while I should have asked first, I’ll risk reprimand because I didn’t plan ahead better and because I think you really need to see this so you can get excited, too! I know it’s just a peek, but I’m so excited to see what she comes up with. It’s a straight sci-fiction piece…and I’ll just leave it at that until we’ve got a little more. A few months ago I reconnected with another artist I worked with back in the Malibu days and we just swapped a handful of emails before it came up he was interested in doing more comic work. 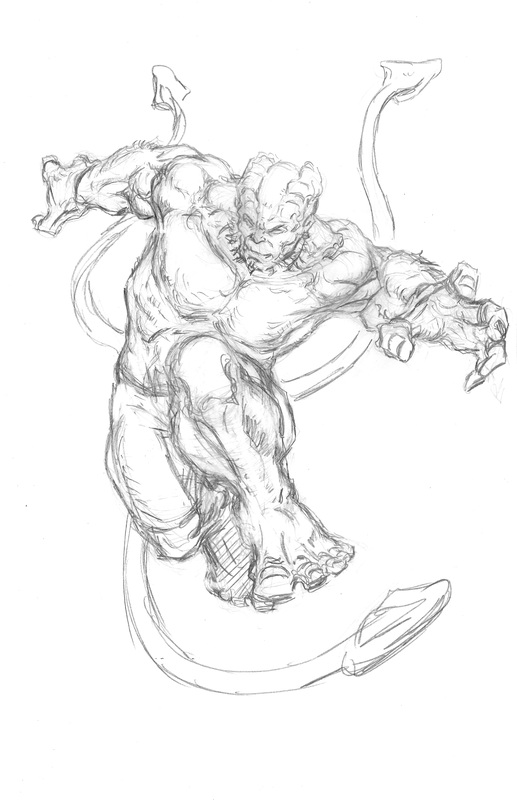 As I don’t have an editor’s budget anymore, I laid it out for him and he was still interested and so we’ve kicked around the idea of a second Demon’s Tails mini-series. 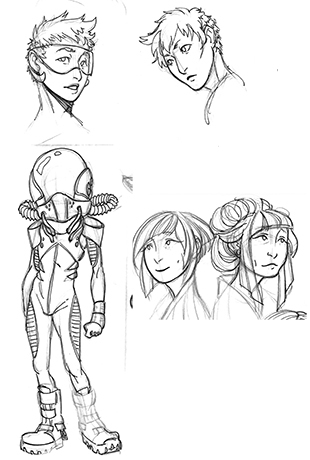 Patrick Rolo has drawn a few sketches at this point, as I’m still fleshing out the plot for it as well. I love the way he handles Demon, though…so I hope you’ll be seeing much more here. Last, but certainly not least, I’ve just started talking to an independent publisher about doing a series of graphic novels. While nothing’s set in stone yet, I’m very excited about the optimism and excitement displayed by the publisher. Yes, I’m intentionally being very vague because of that very thing. I don’t want to say too much. I will say this (so those of you really paying attention might actually figure out which project it is): the story started as a comic series then shifted to an illustrated novel. The novel is written. Finished. The content screams for images, though, and so I’m SOOO excited to be talking about turning it into a series of graphic novels. Yep, you’ll definitely hear more here when I can talk about it. A few other things kinda cool—not quite as exciting as the new stuff, but still kinda cool. I’m working on graphic novel collections/compilations for some of my older work that is no longer available for whatever reasons. I’ve collected as much of the original art as I could find and am moving forward. First up will be Demon’s Tails (and it helps, I think, that I’m working on vol. 2! ), followed by Krey. The only way these are currently available are as back issues—and likely in the reduced boxes. I know I pick them up from the reduced box when I can find them to take them to shows—but I’m tired of looking, so I’ll just print up the compilations and also try to make them available digitally! Dang it, got long again. Thanks for hanging in with me!